THE LOD MOSAIC is moving to the Legion of Honor Fine Arts Museums in San Francisco later this month: MARVELOUS MENAGERIE: A Roman Mosaic from Lod, Israel – At the Legion of Honor (SF Sentinel). From the Elephantine archives, the first historical documentation of a Jewish woman. In the late 19th century, various archives from Elephantine were discovered, transcribed and translated from the original Aramaic. When property was passed on or decisions were made in court that concerned property, the papyri upon which these legal activities were recorded were retained by the owner. The Jewish woman Mibtahiah’s archive contains 10 documents found in superb condition; they reveal surprising details concerning her life and the options available to Jewish women in this settlement. "Mibtahiah" was one of the short-identification questions in the midterm for my Old Testament Intro class a few weeks ago. UPDATE (7 April): Another media reference to the Elephantine papyri in the same week is noted here. The post also collects related earlier posts. RANDOM THOUGHTS on the fake metal codices. The tree iconography is the same on the demonstrably fake codex and one of the others. And they used the same mold. Who puts alligators on their holy codices anyway? Nevertheless, I'm going to throw caution to the wind and just say all of the metal codices are fakes. A guy who thinks science and religion can be reconciled by the study of energy vibrations got fooled by forged antiquities. What is the world coming to? David Elkington knew they were fakes when he started all this hoopla a month ago. Want to take any bets on whether he showed Thonemann's letter to Davies and Barker? The codices were in Sindaran anyway. No one can get over the fact that Larry Hurtado said "Chill dude" to the director of the Jordanian Department of Antiquities. Christianity Today couldn't even bring themselves to include the "dude" in the quote. Shocker: The media misquoted scholars on the codices. And I'm not talking about the "dude," which is forgivable. So far only Christianity Today and the Examiner have noticed that the codices are pretty much fakes. Crickets chirping over at the BBC, the Telegraph, the Daily Mail, the Christian Science Monitor, and Fox News. Kudos to the New York Times for ignoring the whole thing. That was fun! But I do hope that the next major "find" turns out to be, you know, real. Back to the Old Testament Pseudepigrapha for me! I like my fakes ancient. FROM DR. PLATYPUS: Biblical Studies Carnival LXI – March Madness Edition. Good job, but needs an update on the fake metal codices. So basically we have an answer. The Koreans are calling a book of collections of Talmudic stories "The Talmud". The Talmud (either the Bavil or the Yerushalmi, but I assume they mean the Bavli) is a work of many large volumes, so presumably they are talking about abbreviated versions here. HEBREW-INSCRIBED-METAL-CODICES WATCH: A FAKE. I have a reply from Peter Thonemann, which I reproduce below with his permission. Photos now added. The embedded photographs did not come through, probably because I'm working from a computer that does not have Word installed, so I had to open the document with TextEdit. In relation to a discovery that I have been investigating in the Middle East I was given your email address by a friend […]. I am a biblical historian and specialist in the field of Christian and Hebrew origins. I'm working with Prof. Philip Davies of Sheffield University and Dr. Margaret Barker on a discovery that I made a few years back of a cache of ancient metal codices. They are comprised of lead and of copper - it is one of the copper codices that brings me to you. We think that it has a possible origin in Alexandria at the beginning of the 1st millennium AD - (the Bedouin who brought them to me said that his father found them in northern Egypt). It has an inscription in Greek along the top. A putative investigation has failed to find the meaning, dialect or type of Greek used and we are seeking to find an expert who might help in determining what it says. If you can I would be terribly grateful - I could email you a photograph of the codex as soon as you would like, however I would very much like to discuss it in person if at all possible […]. As you will see, the ‘codex’ concerned is identical in fabric and design to the ones being touted on the BBC and elsewhere; the Greek lettering is very similar in style to the ‘Hebrew’ on the codices depicted on the BBC news website. There can be no reasonable doubt that it forms part of the same ‘cache’ from the Jordanian desert (or Egypt, or wherever) – note especially the metal ‘ties’ at the left of the last photograph. The text literally means 'without grief, farewell! Abgar also known as Eision'. This text, in isolation, is meaningless. ’For Selaman, excellent and harmless man, farewell! Abgar, also known as Eision, son of Monoathos, constructed this tomb for his excellent son (i.e. Selaman), in the third year of the province'. The text on your bronze tablet, therefore, makes no sense in its own right, but has been extracted unintelligently from another longer text (as if it were inscribed with the words: 't to be that is the question wheth'). The longer text from which it derives is a perfectly ordinary tombstone from Madaba in Jordan which happens to have been on display in the Amman museum for the past fifty years or so. The text on your bronze tablet is repeated, in part, in three different places, meaningless in each case. I'm not able to go to a research library right now to look up the Milik article, but nevertheless the conclusion is clear. At least one of David Elkington's metal codices (a copper one) is a forgery. It seems very unlikely indeed, therefore, that any of them are genuine. Background here and follow the many links. UPDATE: The Christian Science Monitor has an appropriately cautious article that takes the trouble to consult a couple of outside views (of Hershel Shanks and Craig Evans): Could new discovery trump Dead Sea Scrolls? Scholars intrigued but cautious. At this rate the mainstream media may actually catch up with the bloggers in the next few days. I wonder when it will finally occur to journalists to start reading specialist blogs. UPDATE: The Deseret News cites bloggers and made some effort to check out the story critically: Ancient metal plates found in Middle East. Good for them. UPDATE: Happy April 1st from James McGrath: Lead Tablets Deciphered! UPDATE: James McGrath also has a good postmortem on the fake-metal-codices story here. UPDATE (2 April): Additional random thoughts here. A Derbyshire scholar has been called upon to help investigate the origins of a collection of relics which could be the earliest example of Christian text. New Testament history expert Margaret Barker, of Borrowash, is examining photographs of the "metal books" found in a cave in Jordan. She was contacted by British archaeologist David Elkington, one of the few people to have seen them. It is thought the artefacts might be almost 2,000 years old. Mrs Barker believes that if the books are genuine, they could be unique evidence of Christian activity as early as 33AD - about the time Jesus is thought to have been crucified. The fact that the thin lead tablets are bound into books, and their combination of symbols and script, for her "tips the balance" in favour of them being of Christian derivation. She will now try to help decipher the meaning of the Ancient Hebrew text, most of which is in code. This is less clear than it might be, but I hope it means that Margaret Barker has good photos of all the leaves in the lead books. If so this is good news, but it needs to get better. Ms. Barker's textual and philological expertise need to be augmented with the expertise of specialists in other areas such as palaeography, ancient iconography, ancient metallurgy, etc. But this seems to be a start and I look forward to hearing what she finds. Oh, and to seeing good photographs of all the plates released and posted online. Did I mention that? Archaeologist Mr Elkington is heading a British team trying to unravel the mysteries of the books and to get them safely into a Jordanian museum. He contacted Mrs Barker on the advice of the Archbishop of Canterbury. Mr Elkington admits the books have attracted intense interest. During the course of his research, he said he and his wife had been shot at and received death threats. As Doug Chaplain has noted, Mr. Elkington is hardly an archaeologist (the BBC should be able to figure this out). His work seems to involve goofy New Age "energy vibrations" and I see no evidence that it should be taken seriously as any kind of scholarship. As an aside, it's interesting to hear that the Archbishop of Canterbury is involved in this too. 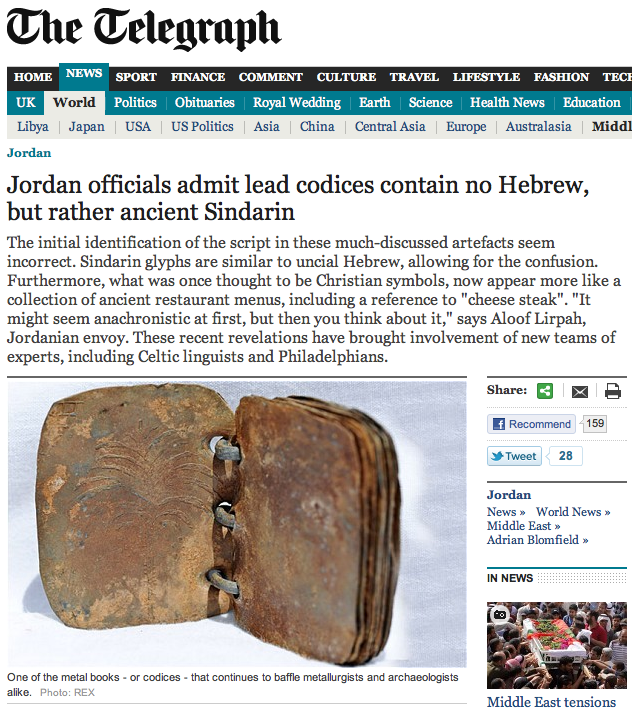 UPDATE: There's now a Jordan Lead Codices Wikipedia page. April DeConick: Lead Tablets? Come on. ANOTHER UPDATE: James McGrath links to a page (link updated to blog rather than Google reader - 6 April) by Daniel McClellan which copies what purports (unverified) to be an e-mail by Oxford scholar Peter Thonemann to Mr. Elkington rejecting the genuineness of a certain bronze tablet bearing a Greek inscription, because the Greek had been poached in part from an early second-century-CE Greek/Aramaic tomb inscription from Jordan published by J. T. Milik in 1958. Got all that? So ... is the e-mail genuine and does it have something to do with this corpus of lead and copper codices? I have e-mailed Dr. Thonemann and will let you know what I find out. UPDATE (1 April): At least one codex is a forgery, so almost certainly all of them are. ANOTHER WIFE FOR GOD: The Holy Spirit as Wife of Adonai in Mandaeism (James McGrath). MICHAEL SATLOW reports on the Talmud conference at Yeshiva University: Archaeology and the Talmud: 1, Archaeology and the Rabbis: 2, Conference Reflections: Archaeology and Texts. SAD NEWS: BEN ZION WACHOLDER passed away this morning. I heard originally from Jack Sasson's Agade List and from others since. For a summary of his illustrious career, see p. 28 of this pdf file. May his memory be for a blessing. Zahi Hawass, who resigned as Egypt’s minister of antiquities less than a month ago under criticism for his close ties to former President Hosni Mubarak, was reappointed to the post on Wednesday, Agence France-Presse reported, citing an Egyptian news report; Mr. Hawass, reached by phone, confirmed his reappointment. Well, good for him. But since he is back, it seems relevant to recall his unfortunate comments about the Jews a couple of years ago (read the update too). Let us hope his future work in Egypt will not be informed by such views. The case will now return to the lower court for further argument. Among the remaining questions is whether the antiquities might be seized under the Terrorism Risk Insurance Act of 2002. With all due respect to and great sympathy for the terrorism victims, I think this is the right decision. For background and my reasoning see here and follow the links. The story is neither very clear nor very encouraging. My reaction at present is that if it sounds too good to be true — and this find certainly does — then it probably isn't true. That said, the Dead Sea Scrolls also sounded too good to be true, but were real anyway, so let's just keep an open, skeptical mind. Today's Daily Mail also has a new article on the plates. The content is old news, but there are new pictures that give a clearer view of some of the iconography, but not the writing. There is also a picture of the inside of the cave where they were supposedly discovered. It seems pretty clear now that the texts posted on the Unicode mailing list in 2007 must be from the same corpus. UPDATE: Larry Hurtado to the director of Jordan’s Department of Antiquities: "Chill, dude. Take a breath." Indeed. Doug Chaplin comments here, notably on the reported credentials of David Elkington. UPDATE: David Meadows recaps how we got here, with much skeptical commentary: Lead Codices Silliness. UPDATE: David M. now notes that Gawker has taken up the story: Possible Da Vinci Code Prequel Unearthed. UPDATE (31 March): More here. THE NEWARK STONES are back in the press, as a salutary reminder that supposedly ancient Hebrew inscriptions of dubious origin are nothing new. COSHOCTON -- More than 30 people attended a lecture about the Newark Holy Stones at the Johnson-Humrickhouse Museum. The speaker was Dr. Bradley T. Lepper, a Newark resident who is curator of archaeology at the Ohio Historical Society. This has been such a fascinating search," Lepper said. "I've researched several of the players involved in the discovery and those who authenticated them at the time to try to determine who might have been behind this. We have to immerse ourselves in the time period of 1860 and understand what was going on with science, religion and politics to see why this hoax would have been done. "I believe these stones are scientific forgeries designed to answer the polygenist arguments (claiming there were distinct racial types) which were popular justifications for slavery. The stones represent an attempt to encompass the prehistory of the New World within the biblical history of the Old. I also believe Rev. McCarty was instrumental in this forgery and that David Wyrick was just a pawn. It would appear that the Newark Holy Stones were aptly named since they may have been created for a holy purpose -- the freeing of America's slaves." Patti Malenke, director at the Johnson-Humrickhouse Museum, said the Newark Holy Stones are a popular attraction at the museum. "The Johnson brothers purchased the Holy Stones in the 1870s and later tried to sell them when they learned they may be fakes," she said. "It's a good thing they didn't sell because today the Holy Stones are our 'claim to fame.' We have bus loads of people who come here from all over to see them, and we've shipped replicas of the stones throughout the world." The article includes a (bad) picture of the artifacts. Rochelle Altman has argued that the Newark stones are not so much forged as misunderstood, but others seem to think they are straightforward forgeries. More on them here (noting a mention by Glenn Beck that also drummed up some business for Newark) and follow the links. DR. WAYNE STILES: Sites and Insights: Caesarea’s Archeological treasures. Eusebius was not exactly a "pupil" of Origen. Origen was dead before he was born. But they both worked in Caesarea and Eusebius made extensive use of historical resources left by Origen. The three monotheist religious traditions, Judaism, Christianity and Islam, have more in common than in contention. All three believe God is one, unique, concerned with humanity's condition. Each takes up the narrative of the others' -- Christianity and Islam carrying forward the story begun in the Hebrew scriptures of ancient Israel that define Judaism. LIBYAN PUNICA: A CAPSULE HISTORY: From Carthage to the Colonel (Deccan Chronicle). Reports of the Talmud being a national classic in South Korea have been floating around for several years, but it’s now official: The country’s ambassador to Israel, Ma Young-Sam, told the “Culture Today” TV show that Talmud study is now a mandatory part of the country’s school curriculum. In addition, it is said, almost every home in South Korea boasts a Korean version of the Talmud, and mothers commonly teach it to their children, who call it the "Light of Knowledge." Before I get excited about this iconography I would like to see clear pictures of it and get the views of those who specialize in such things. Contra the comment attributed to Mr. Elkingon, ancient representations of seven-branched menorahs are not uncommon and are a signature feature for Jewish provenance of inscriptions. Examples are here, here, and here (Wikipedia Commons). I'M IN SAN DIEGO NOW. No more flight complications. STUCK IN AMSTERDAM OVERNIGHT. Delayed flight from Edinburgh caused missed connection here. I just did this in October — same hotel, even — and it's getting old! At least the food is good. Look for me Tuesday evening or Wednesday morning. I'M OFF TO CALIFORNIA AGAIN. I expect to arrive in San Diego very late tonight. I shall be very busy, but I should have time for some blogging during the week. A BLOG ON THE MYSTICAL HERETIC AHER (Elisha ben Avuyah) and related matters, sort of: Davar Akher, by Simon Holloway. An account of the traditions about Aher begin with this post. AWOL: A Bibliography of Semitic Linguistics. THE IAA REPORTS: Tombs found at Jaffa excavation site not Jewish. Haaretz: "Announcement comes after examination of site revealed burials contained pig bones, allowing archaeologists to conclude they were not Jewish burials; excavation has been site of ultra-Orthodox demonstrations." But the ultra-Orthodox are not yet convinced. PETER FLINT has a Dead Sea Scrolls website. THE ENCYCLOPEDIA OF JEWISH MYTH, MAGIC, AND MYSTICISM (2007) by Rabbi Geoffrey W. Dennis is reviewed by Cynthia Astle at About.com Ancient/Classical History. I've not heard of this book before, which maybe isn't a good sign. That said, Llewellyn Press is New Agey, but it does publish some okay popular stuff. However, the review has the book saying that ancient Jewish incantation bowls were found in Israel and Mesopotamia, and this is incorrect: the provenanced ones come only from Mesopotamia. But perhaps the book or the reviewer is thinking of metal amulets from the same period inscribed with incantations, which do come from Israel. (I'm not talking about those recently publicized lead plates of uncertain provenance and genuineness, but other ones from late antiquity (on silver and, I think, bronze or copper) which at least sometimes are clearly genuine.) Also, I know of no evidence for mezuzot as early as the fourth century B.C.E., although I think there are some from Qumran from the first century or so. If you have or get this book, use with caution.